- Add a drop or two of essential oil or fragrance oil on the lava stone point, and it will be instantly absorbed. Then, as you go through your day, the aroma from the oils will be released, uplifting you with its therapeutic effects. Beautiful as well as functional: what's not to love! A lustrous rainbow moonstone cabochon set in sterling silver adds a perfect finishing touch with its subtle beauty. This pendant measures 1 3/4" tall, including the bail. It comes with an 18" sterling silver chain. What legends and lore are associated with lava stone? 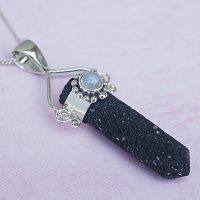 Like a volcano, you will sometimes undergo drastic disruptions in your life, and when that happens, lava stone is a natural ally. It is said to aid in situations where you need to find stability amidst the uncertainty. When your strength and courage are failing, lava stone can help you shore up your battered defenses and find a way forward. It is also reputed to benefit your health and energy levels. 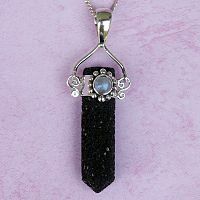 It is strongly associated with the elements Earth and Fire, and is an excellent stone for grounding. 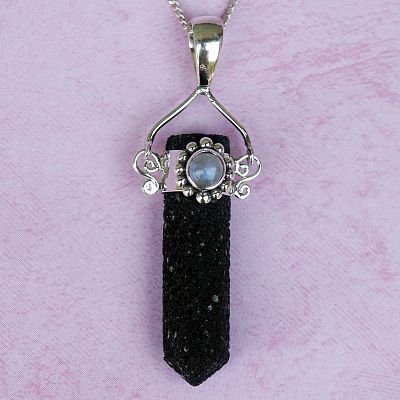 Do you have any other questions about our Lava Stone Point Aromatherapy Pendant?